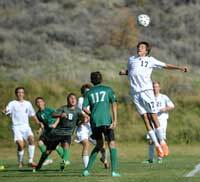 Wood River and Twin Falls battled through extra time and needed a penalty kick shootout to decide Wednesday’s Great Basin Conference loser-out boys’ soccer tournament game at SunWay Soccer Complex in Twin Falls. In the end, with darkness descending, Twin Falls (8-9-2) sur-vived to play another day 1-1 (4-3 kicks) over fourth-place Wood River and moved on to play Bishop Kelly of Boise (10-3-3) in a state play-in game Saturday, Oct. 18 at Mountain Home. Bishop Kelly also won an overtime tournament game to ad-vance on Wednesday, 4-3 over last year’s State 4A consolation champion Caldwell (12-6-2). It was a tough task for a young Wood River team Wednes-day, playing 100 minutes of soccer after its 3-0 loser-out home win over Burley just 24 hours before. Junior Danny Graves equalized in the 72nd minute after Twin Falls led 1-0 at half. The two longtime rival teams stayed tied 1-1 after two 10-minute golden-goal overtime periods. And Wood River once again had to rally in the penalty kick shootout. Graves and Carter Ros had their shots blocked. Wood River goalkeeper Kyle Weller saved the first Twin Falls shot, but the play was called back after Weller took a step forward. Awarded a re-kick, Twin Falls scored, and then made it 2-0. Alex Leon, Weller and Sage Kelly succeeded on Wood River’s final three kicks, but keeper Weller could block just one of the final three Bruins kicks giving Twin Falls the rubber game of the three-game series between the teams. He said the season “was a great effort and big accomplish-ment with a young and talented team. “We can only look for-ward and prepare to become more experienced and stronger next year,” said the sixth-year coach. - Final team statistics: Wood River 8-10-0 (5-3-0 home, 2-7-0 away, 4-6-0 league for #4 seed, 4th place in GBC tournament. Goals scored: 36 (2.0 per game). Goals against: 32 (1.8), 5 shutouts. Individual scoring: Sage Kelly 7, Danny Graves 7, Jose Quinonez 7, Carlos Gonzalez 3, Alex Leon 3, Yuri McClure 3, Clay Cutler 2, Kyle Weller 2, Carter Ros 1, Mikey Levy 1. Wood River defeated Burley Tuesday for the second time in five days on Hailey’s South Valley Sports Complex soccer field. Coach Monjaras’ No. 4-seeded Wolverines exploded for three goals in the first half Tuesday and eliminated the No. 5-seeded Burley Bobcats (5-11-0) by a score of 3-0 in a loser-out game of the six-team Great Basin Conference tournament. Freshman Jose Quinonez, junior Mikey Levy and junior Yuri McClure scored in the 11th, 15th and 40th minutes for Wood River, and senior goalkeeper Kyle Weller (6 saves) pre-served his fifth shutout with a dazzling fist-away jump save on a long Bobcat bid in the 77th minute. Wood River out-shot Burley 17-11 including a lopsided 11-3 edge in the decisive first half. Monjaras praised his players for their ability to control the ball in the midfield, led by senior Sage Kelly and junior Danny Graves, and to capitalize on their scoring chances. The offense did its job Tuesday. Top scorer Quinonez (7 goals) pounced on loose ball in the box after a deflection and scored for a 1-0 lead. Prowling effectively, Kelly and Graves created opportunities to apply pressure in the early going on Bobcat keeper Salvador Alvarez (7 saves). Yet it was perhaps the prettiest goal of the season that put Wood River ahead 2-0, a goal called “sick” and “professional” by Hailey supporters. Encouraged by Monjaras’ shout-out to reverse the field, jun-ior Carter Ros did just that with a perfectly-placed lead pass from the left flank to the right wing. Junior Ben Brunelle re-ceived the pass and wasted no time crossing into the center, where Levy one-timed it home for his first goal. “Probably one of the best set plays we’ve had, two touches through, a perfect pass from Carter that Ben controlled and Mikey finished,” said Monjaras. Wood River’s final goal just before intermission came on a Burley defensive misplay that McClure fired home for his third goal. Midfield contributors included senior Kyle Mungall with a series of well-placed through balls that tested Burley’s defense, and junior Carlos Gonzalez manning the left side with speed and ball skills. Up front, forwards Quinonez, Alex Leon, Drew Kaminski, Levy, McClure and Omar Farfan all pestered Burley. “They came in solid, stood their ground and were patient with the ball,” Monjaras said. On defense, senior sweeper Jon Scott (hamstring) returned to action when Monjaras determined just before the game that Scott was close to 90% or 95% of effectiveness. He summoned Scott when sophomore sweeper Zachary Williams couldn’t play because of sickness. “Jon played very well and contained a lot of balls in the middle,” said Monjaras, who sat Scott down for the entire sec-ond half with a 3-0 lead. After half, Monjaras moved freshman back Taylor Koth into the sweeper spot for the first time all season and flanked him with Nathan Lambert and Clay Cutler—also moving Kaminski into a second stopper role along with the dependable Ros. It worked well, Burley senior Mitchell Rice coming closest to scoring with a shot off the post in the 68th minute.